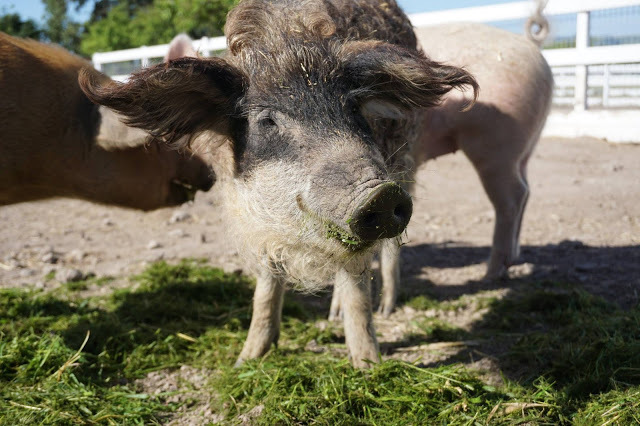 As some of you may know, one of our pig residents – Minnie, looks a little different than your typical farm pig. She is a Mangalista pig, which is considered “the Kobe beef of pork” in the food world. This basically means that this is a high end breed of pig used for pork production. They grow a thick wooly coat like a sheep and are the only remaining pig breed with this type of hair. This breed was the result of crossing domestic Hungarian pigs with European wild boars, and it was very popular in Europe in the mid-19th century. Mangalitsa pigs are known as “lard type” pigs that require lots of space and outdoor access. They had been raised for generations for their fatty meat and lard, but with the introduction of industrial farming techniques in the 20th century, they were losing popularity. This breed typically grows slower than the leaner less fatty breeds that were replacing them in factory farms, so their popularity continued to decline. They’re slaughtered at just over a year old, around 12-15 months, which is more than double the lifespan of the typical “farm pig” used in industrial farms. By 1991, there were less than 200 Mangalitsas left in Hungary. In some countries, they were completely wiped out. A Hungarian geneticist was concerned about their dwindling numbers in the 1990s, so he purchased all of the Mangalitsas he could find in Hungary. Ironically, they saved the breed from extinction in order to continue eating them. Today their population is not threatened and tens of thousands are slaughtered annually. 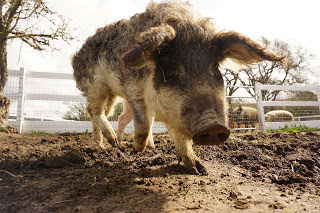 Eighteen Mangalitsas were brought to the U.S in 2007 and they were the original breeding stock in this country. 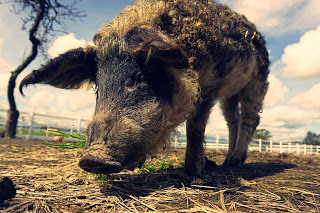 Minnie came to us from a small-scale Mangalitsa breeder in California. He was raising the pigs in his backyard until his vegetarian mother convinced him to find sanctuary homes for all 14 of them. We are very happy to have Minnie here at the sanctuary. She is a rare breed of pig, and so full of personality. She loves attention and is the first one to lay down for a belly rub. She spends most of her time practically glued to her adopted sister Betty’s side. She is almost always covered in mud to keep herself cool (and adorable). She’s a tough little lady and will be here with us for the entirety of her natural life. Next time you're out at Charlie's Acres, you will sure to be admiring her beautiful curly locks of hair!